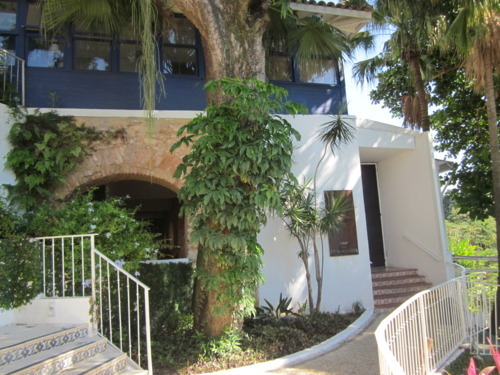 Aprazivel (Rua Aprazivel 62) is hidden away on a small street high on the hills in Santa Teresa facing the Northern areas of Rio de Janeiro. Note: Taking a taxi in and out is a must as you have to drive through some ‘dodgy’ areas to get there. I would never have found it myself if it wasn’t for a friend who recommended it. You could walk past the entrance without realizing the restaurant is right in front of you. After walking down the steep narrow steps (tip for the ladies- walk very slowly! 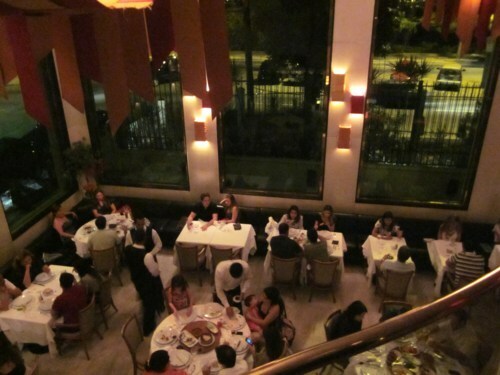 ), we were welcomed by the friendly staff and shown to our table. Since we did not have a reservation we were not seated in one of the ‘tree house’ style tables for this this restaurant is famous for. Yes, I plan to make a reservation and go back to sit at one of those cute tree house tables. Food was delicious! Direct from the Amazon, it is prepared in an open kitchen with a lot of attention to detail and great taste. Everything on the menu looked, and smelled fantastic. Our fish was prepared perfectly, and our small beef with pumpkin starter hit the spot. 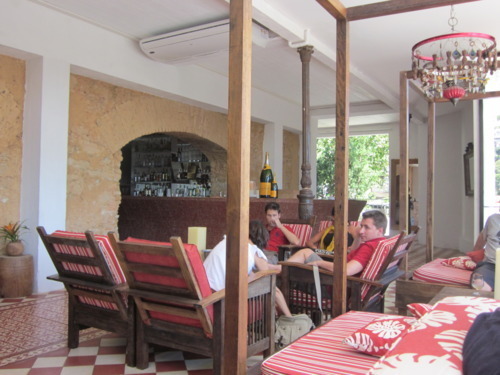 Aprazivel has an extensive drink selection- I recommend having champagne mixed with one of the amazonian fruit juices! 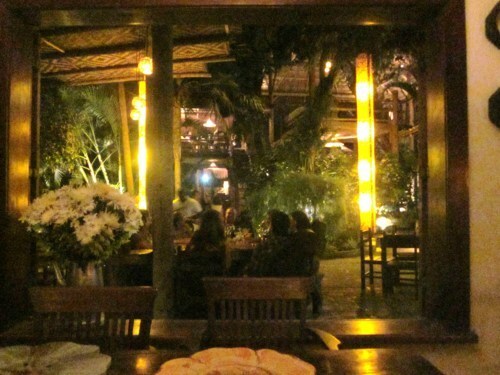 When visiting Rio, this restaurant is worth a detour if you are looking for a romantic escape and nice cuisine in Rio. 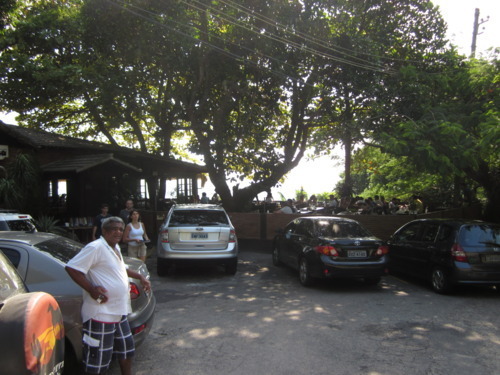 After visiting Ruins Park, we were starving and stumbled upon Espirito Santa From the outside it doesn’t look like much, but once inside you will see how charming this restaurant really is. 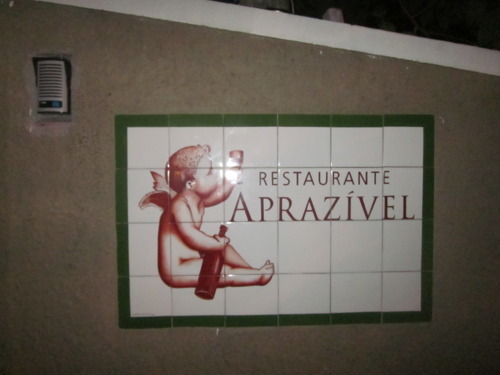 It is rated one of the best restaurants in Santa Teresa (apparently we still have good taste even when famished!) for its Amazon-style cooking. This is a place to get a ‘real taste of Brazil’ as the chef uses only local ingredients when creating delicious traditional Brazilian dishes ie. lots of different fresh fish choices, exotic fruits and vegetables are on the menu. 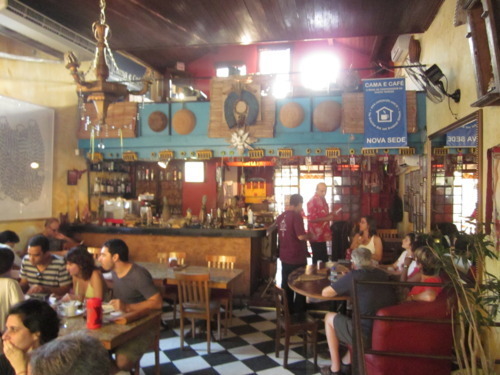 Whether you are heading to Santa Teresa for dinner or drinks, everyone you meet will tell you that you must go to Bar dos Descasados at the Santa Teresa Hotel. 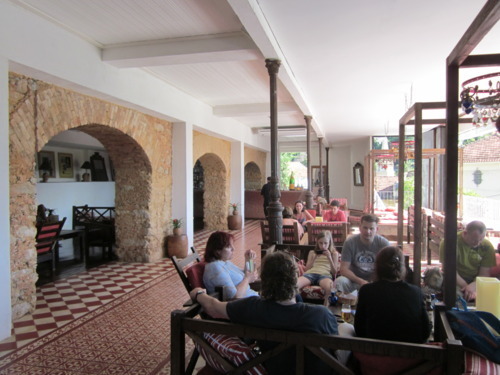 The hotel occupies an old house that was once an old coffee plantation home…. and the bar area was actually once the slave quarters! Now, fully restored, the decor is extremely tasteful, using and abusing a lot of demolition wood and the beauty of Brazilian handicrafts. 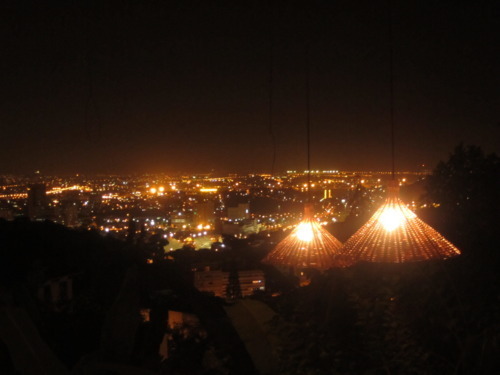 But the real reason people gravitate to this tucked away beautiful hotel is for the breathtaking view of Rio and the delicious drinks! Spend an afternoon or evening (or both, once you get comfortable you may not want to leave) lounging in a big comfy chair,or plush cabana bed on the terrace. Order the ‘French Pink Mojito’ (champagne, rum, cranberry and mint) or the ‘Iced Teresa’ (Mojito with Mate) both are delicious while you enjoy the fabulous views of Rio de Janeiro. If you are hungry for a little snack I recommend the freshly made chips with alioli dip. Though I didn’t eat there, the food looked great and the desserts were to die for— might actually have to make a trip back specifically to try the desserts! Tip: This is a prime sunset spot so try to get there half an hour before so you get a comfy seat! 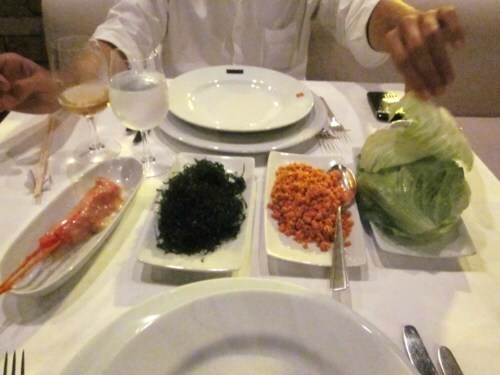 Looking for a modern, fun, ‘New York style’ swanky Asian restaurant in Rio?! Head to Mr Lam in Jardim Botanico (ie the Central Park of Zona Sul). The story goes that entrepreneur Eike Batista enjoyed his meal at Mr Chow in New York SO much that he brought him to Rio to open Mr.Lam. Talk about a dedicated customer- The corner table on the first floor of Mr. Lam is reserved for Eike Batista and usually other patrons are not welcome to dine at his table! He really did bring a piece of ‘New York’ to Rio with this multilevel trendy restaurant- not a typical set up for restaurants here in Rio. Though I didn’t try the noodle dish, as you can see from the picture above, they are hand thrown noodles created table side. 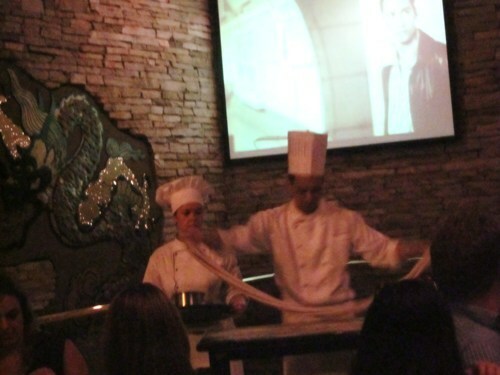 It was great to watch, and when finished the waiter brought the fresh noodles around to show people. 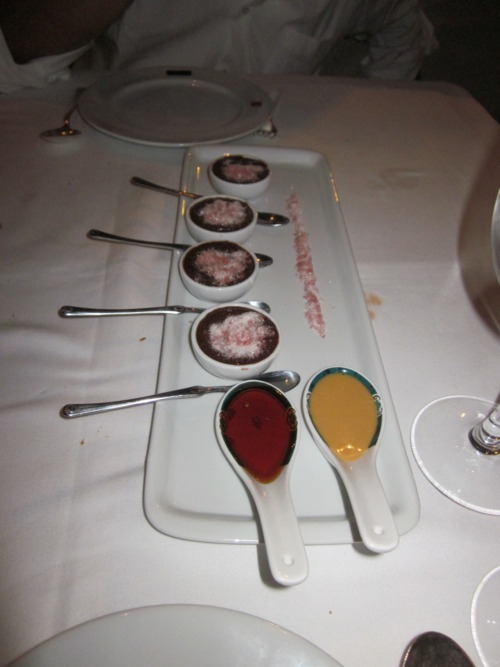 However, it was the ‘Mini Bang’ dessert that seals the deal making this restaurant top 5 in Rio de Janeiro. Mini pots of chocolate mouse/cream with a caramelized cherry at the center and pop rocks sprinkled on top! On the side there are two yummy caramel sauces – a simple and a spicy for you to pour on or dip your mouse into. Of course there is an additional line of pop rock candy decorating the center of the plate— Mmmmm good!! I highly recommend Mr. Lam! It is the perfect spot for a special occasion, romantic night out, a group dinner, or if you are just craving a perfectly prepared meal with a beautiful atmosphere. 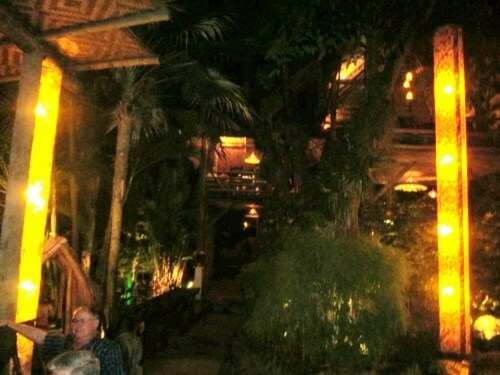 Brigittas Restaurant captures what Búzios really is: charming, easy going and with a certain air of sophistication. 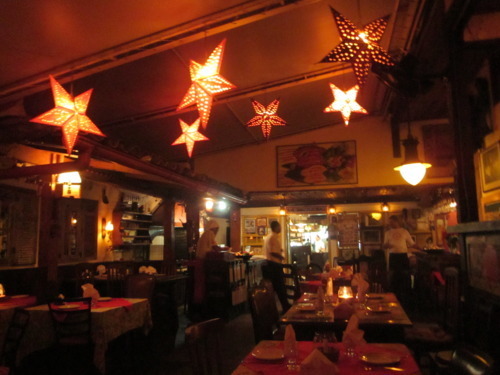 There is a small bar with an eating area in the front of the restaurant and about four tables scattered in front, but the real entrance is through a small, well-hidden door, leading into this adorable restaurant with live music. There is no back wall at Brigitta’s; only an opening to the sand, the bay, and the fishing boats. We ventured outside of Leblon to some of the most beautiful beaches in Rio (about 45mins/hour drive). After hanging out on Grumari (see earlier post) we decided to head up the mountain and see if we could find a place for lunch. 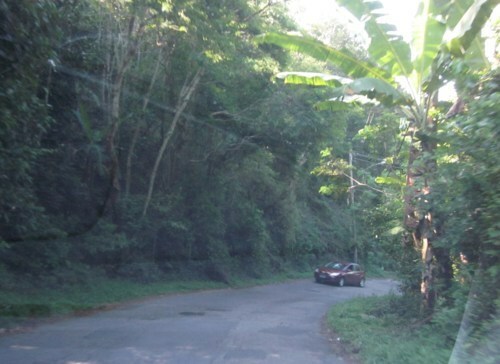 The drive up the mountain is beautiful, tropical green everywhere you look; however it is a very curvy narrow road up (similar to Positano, Italy). 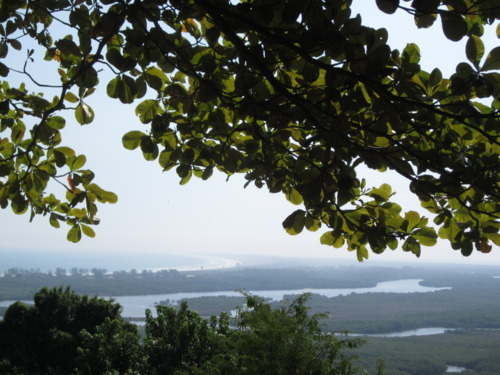 Once we reached the top, we discovered Restaurante Point de Grumari. Talk about an incredible panoramic view! There are def postcards of this scenic view. While dining you can see the mountains, the lagoon, and the ocean! The inside of the restaurant is very large and has a ‘tropical feel’; light and airy with various sculptures along the walls. 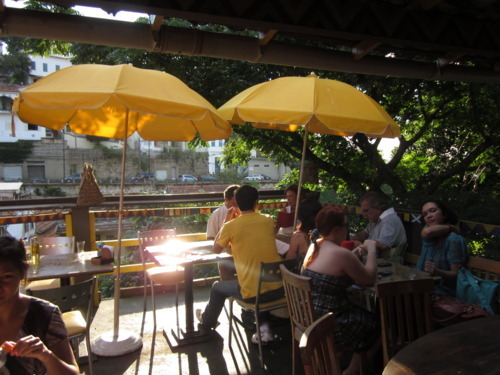 The outdoor deck (pictured above) is unbelievably peaceful, the breeze feels great-and come on, we are in Brazil…obviously sat outside. The restaurant specializes in seafood and has wonderful fresh fish options. We had the dorado (my first time trying it) and it was excellent, grilled to perfection. 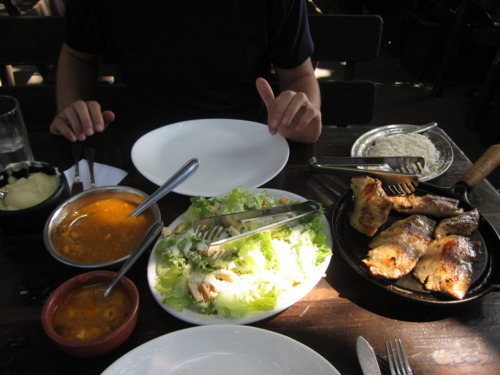 Of course as with almost every meal you will eat in Brazil, it comes with rice and a few other yummy sides. If you don’t like fish, there are a number of steak options. 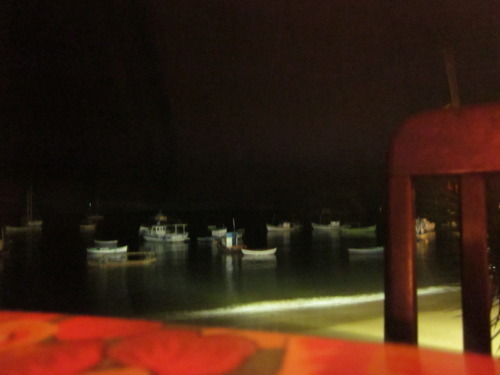 Either way, if you are spending a day at Grumari, Prainha or Macumba, head here for lunch!